Aggregates of small spheroidal growths of Austinite crystals with an ivory-white color, on a Goethite matrix. The sample, from the type locality for the species and of a better quality than usual for the mine, is from the Al Ordway collection, whose label we will send to the buyer. 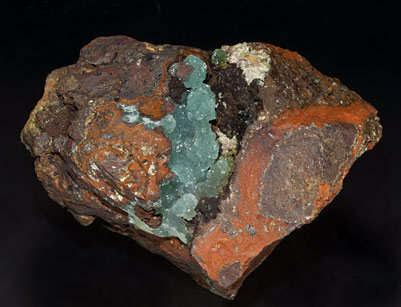 Spheroidal aggregates of small but very sharp Austinite crystals that are translucent, bright, with curved edges, and with slightly-bluish green color. 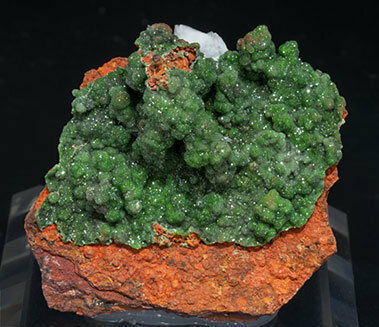 They are on limonite matrix, with small Adamite crystals. The sample has been analyzed and we will send a copy of the analysis to the buyer. 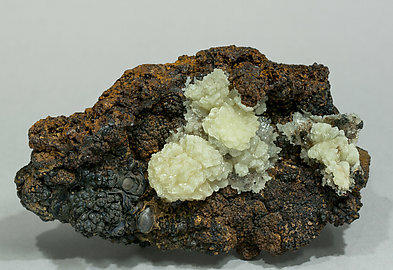 Botryoidal Austinite (cuprian variety) on a limonite matrix. They are bright, have a deep and uniform green color and are with a white rhombohedrally terminated Calcite crystal. The sample has been analyzed and we’ll send a copy of the analysis to the buyer. 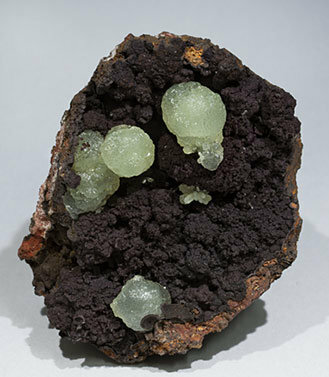 Spheroidal aggregates of translucent crystals with a clear green color and on a limonite matrix, with small Adamite crystals. The Austinite has a level of transparency that is unusual for the samples from the Ojuela mine. The sample has been analyzed and we’ll send a copy of the analysis to the buyer. Translucent globular Austinite growths with a very intense and uniform green color. 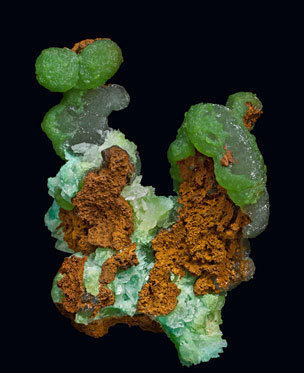 They are on a limonite matrix, with small cuprian Adamite crystals that have a clearer green color. Due to its color and shape the sample is very esthetic. Both the Austinite and Adamite have been analyzed and we’ll provide a copy of the analyses to the buyer.